This is the new Humphrey Visual Field Analyzer 11-i series by Zeiss. It is used to evaluate the central and peripheral vision of a patient. Glaucoma diagnosis cannot be made without the use of this machine. It is also used in monitoring the progression of glaucoma and other conditions of the optic nerves, the retina, the visual pathway and the brain. Life threatening conditions of the visual pathway such as brain tumors, tumors behind the eye can be detected with this machine. 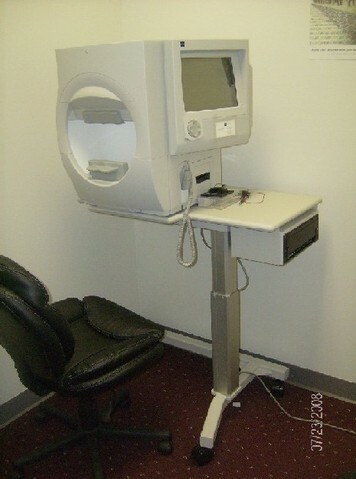 ​Dr Nwokedi recommends that all his patients undergo a 3 minutes visual field screening test using this equipment.